Hope you're enjoying your weekend! We've got some HOT weather coming our way, so far this year we've only had 3 days over 90 degrees, and it looks like we're going to get almost a full week of them this week - hope you're all staying cool! This pattern from the Basic Grey June Bug Collection, just screams summer to me. Here's I've combined it with this beautiful Poppy from The Rubber Cafe. Using my Stampin' Up! Markers, I used the Marker Watercoloring Technique to color the image, then used the Out of the Box Technique to pop parts of the Poppy outside my panel. The edges are sponged with Soft Suede. 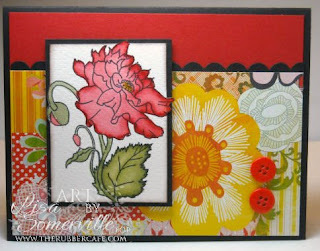 The Scallop edge under the June Bug paper is created with Stampin' Up! 's Scallop Edge Punch. WOW Lisa! I like it. Not your usual - but I like it. It does scream summer! Lovely job Lisa! We've got that same HOT weather down in in SW IL. Uhg! Keep cool! I'm having a hard time putting down the June Bug paper. You did a fantastic job with the coloring of the flower to match the paper!